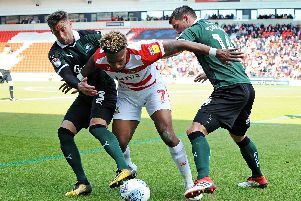 Doncaster Rovers: What is chief executive Gavin Baldwin’s verdict on 2017/18 season? Chief executive Gavin Baldwin says Doncaster Rovers have ‘solid foundations’ to build on over the summer. Rovers finished 15th on their return to League One. Over the course of the season they never broke into the top six nor dropped into the bottom four. Rovers have a five-year plan to be a sustainable Championship club by 2022 and Darren Ferguson’s side will be expected to push for a play-off spot next term. “As we look back on the 2017/18 season, we can do so with a sense of pride and optimism,” said Baldwin. “Everyone connected with the club wants us to be challenging in the higher reaches of the table, but the progression of the team and club is evident. “This has ultimately been a season of consolidation, but it has had some really high moments and there are some solid foundations for us to build from over the summer and into next season. “We have a young and talented squad, all of whom have plenty of scope for further development.